In this video lesson I’m teaching my ideas on open string clusters, getting the most that I can from open strings mixed with chords that usually don’t carry open strings. 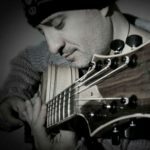 The aural sound that happens is only possible on guitar, so it’s a good tool for comping, composing, chord melody, and finally for improvising. Actually, when you want to play with these shapes, you need take care of your right hand first, trying that the volumes sound the same, and stretching your left hand due the clusters. So these chords are a very good exercise for technique of both hands. I’m in love with these sounds. For me, it’s very exciting to finish a line or melody and add one of these beautiful chords. It sounds like a modern piano player but also a contemporary guitar player. So again we are in the league of post bebop players. In the video lesson you can learn to apply these chords to standards, blues, bossa novas, intros, endings and solos. Hope you enjoy a lot as I did. Super, super class. Lots of great ideas, lots of practical uses for some fascinating dissonant note collections. I just found the written materials hard at times to match up with the shapes and ideas Juampy was demonstrating, but after a couple viewings, I got it all straight. Great class.